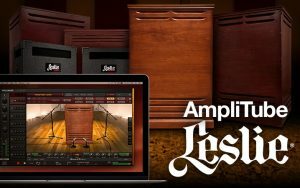 January 25, 2018 – IK Multimedia is proud to announce a new collaboration with the product designers and R&D Team at Hammond USA and Suzuki Music Corp. of Japan, bringing the truly authentic sound of the legendary Leslie® amps and cabinets to the leading guitar amp and effects software, AmpliTube, and to the world class mixing and mastering processors in T-RackS. With the powerful combination of IK’s breakthrough technologies of Dynamic Interaction Modeling™, which can reproduce the subtlest interactions of an electronic circuit down to its tiniest component, together with Volumetric Response Modeling™, which recreates the real acoustic behavior of rotary-speaker cabinets, the IK and Hammond teams succeeded in delivering the true Leslie speaker sound without compromise. All the speaker cabinets are faithfully reproduced using IK’s exclusive Volumetric Response Modeling™ technology, which is a combination of a new approach to impulse response recording, and the best modeling technology currently available. There are 6 rotary speaker models included: Leslie Type 147, 122, 122A; Leslie 3300w, Leslie G-37, Leslie Studio 12. The virtual microphones in AmpliTube Leslie and T-RackS Leslie can be repositioned. This affects the perception the listener will have of the rotation, or “doppler effect”. Users can choose between a 90° mic position, which is the most common, giving a non-symmetric perception of the rotation, to the 180° mic position, which is less common, but heard on many famous recordings, and gives a more symmetric perception of the rotation. It is also possible to move the virtual microphones closer or further from the cabinet for even greater realism when recording. There is a full parametric EQ to further shape the sound to fit a variety of musical ideas even better. This entry was posted in News and tagged amplitude, flux, IK, leslie, multimedia, new, software, VST. Bookmark the permalink. ← BeatMaker 3 for iPad is FREE during NAMM!